In 2010, the NFL decided that all games in the final week of the season would pit divisional opponents against each other. This was done in an effort to make the games more meaningful and to keep teams from resting their regular players for the postseason. The format remains in 2014. In addition, there is not a pre-determined Sunday night game prior to the season. The league takes the game with the most playoff implications and places it in the Sunday night slot in the days leading up to the final Sunday of the year. There is no Monday night game on the schedule in Week 17. Many rivalries will be revived on the NFL Pick Em Week 17 sheet. The New York Giants will host the Philadelphia Eagles, while the Dallas Cowboys will be on the road to face the Washington Redskins. In the NFC South, the Carolina Panthers will face the Atlanta Falcons, while the Tampa Bay Buccaneers will square off with the New Orleans Saints. In classic AFC matchups, the Pittsburgh Steelers will welcome the Cincinnati Bengals to the Steel City. The New York Jets will travel to Miami to meet the Dolphins, and the Baltimore Ravens will host the Cleveland Browns. 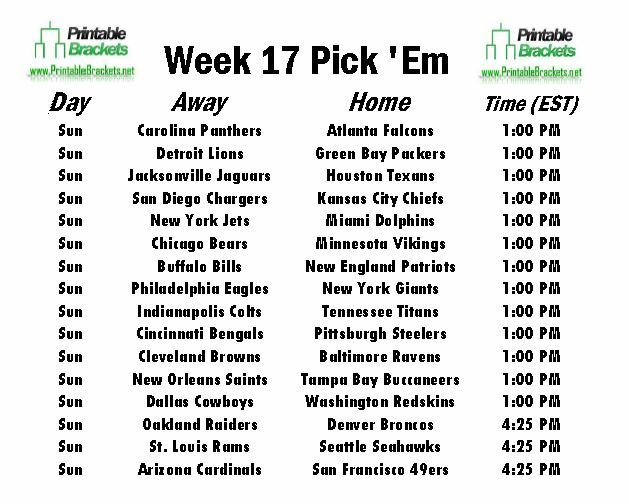 There are three tentatively scheduled late Sunday games on the NFL Pick Em Week 17 sheet. The Denver Broncos will battle the Oakland Raiders. The San Francisco 49ers will collide with the Arizona Cardinals, and the St. Louis Rams will play the Seattle Seahawks.